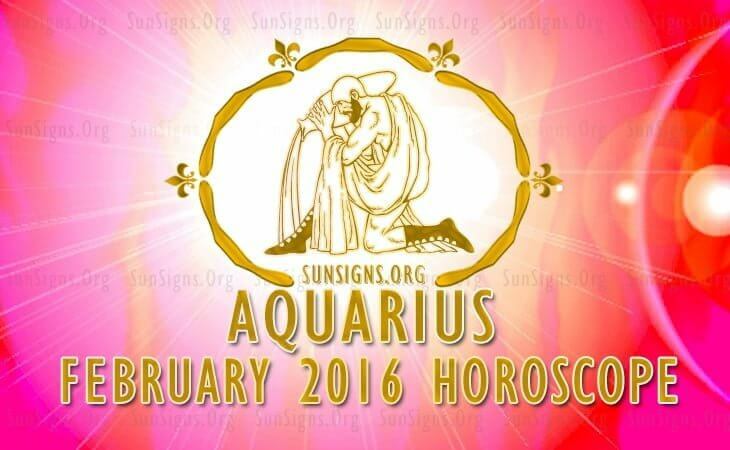 Aquarius February 2016 Horoscope foretells that home and spirituality will be prominent during the month. Professional accomplishments can be in the backburner for the time being and new opportunities will definitely crop up in future. Your emotional strength will be advantageous for envisaging future objectives in profession and formulating your strategies. Planetary power is situated in the Eastern half of the horoscope for the Aquarius zodiac sign in February 2016. Your poise and confidence are very powerful and you can fearlessly have your way in pursuing your targets in life. Your resourcefulness and activities will decide your destiny. There is no need to depend on others as you are your own boss. Aquarius, you will be interested in building a new personality.This will involve buying appealing accessories for yourself and making yourself more sexually alluring to others. Office environment for the Water Bearers will be challenging in February 2016 and you will feel suffocated by the constraints and want to work freely. However diligence and sincerity will be the succeeding factors eventually in February 2016. Eclipse times will prove tough for your relationship with your colleagues and superiors. February 2016 monthly predictions for Aquarius forecast that this will be a favorable month for accomplishing your financial targets. Planetary decanates are encouraging and the whole world including family, social contacts and your love mate will encourage you to thrive. Your financial intelligence will be very active and you can use it for attaining your fiscal targets easily. Investments in power sector and gold will give handsome profits. Single Aquarians in love will be looking for passion from their partners till 19th February. You will expect you love mate to support you financially during the latter part of the month. Love during middle of the month can materialize abruptly during February 2016 for the Aquarians. The Aquarius February 2016 love astrology horoscope suggests that this is a good time to get pregnant. Try these Feng Shui tips for pregnancy. On the family front, your marital relationship will be wonderful and there are both romantic and monetary assistance. Elder members of the family may prove difficult during eclipse and will test your tolerance limits. Home atmosphere will be quite testing during the month and it will require all your diplomatic skills to maintain the harmony in the house. Health will be excellent during this month till 18th February for the Aquarians. You will be enriched further by good nutrition and proper care. You will be more energetic and will have plenty of zeal. To conclude, February 2016 Aquarius forecasts suggest a warm and enjoyable month with family and friends with excellent health and wealth.